By Mike Hudson, Museum Director, American Printing House for the Blind Museum; Reprint from American Association of State and Local History News,Autumn 2018, Vol. 73, #4, p.5. When I started working at the Museum of the American Printing House for the Blind, I immediately knew something was wrong. The display cases open up to allow their contents to be touched, and there is not a single “Don’t Touch” sign in the building. I had a fairly conventional museum studies education and a fairly conventional job at a state history museum before this one, so it all seemed very unorthodox to me. Years later, I see things differently. Our museum is located in the original 1883 building of the American Printing House for the Blind (APH) in Louisville, Kentucky. 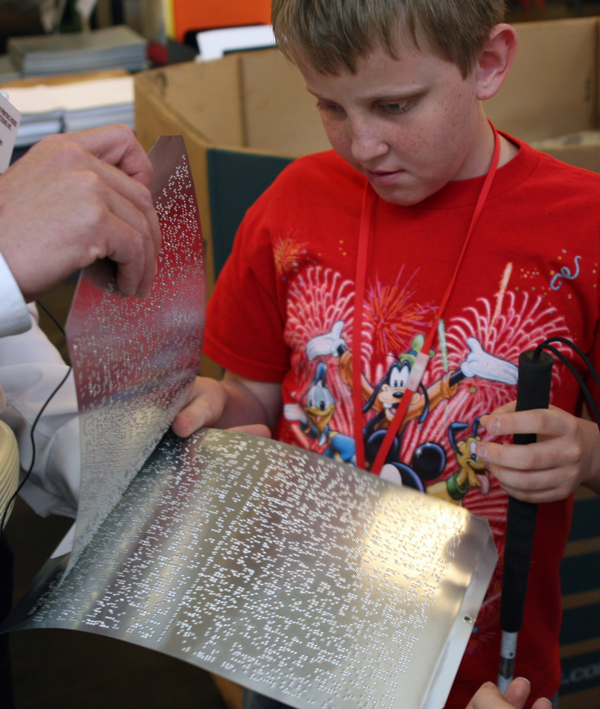 APH was founded in 1858 to supply accessible learning materials for students who are blind or visually impaired. Today, it is the largest such company in the world. 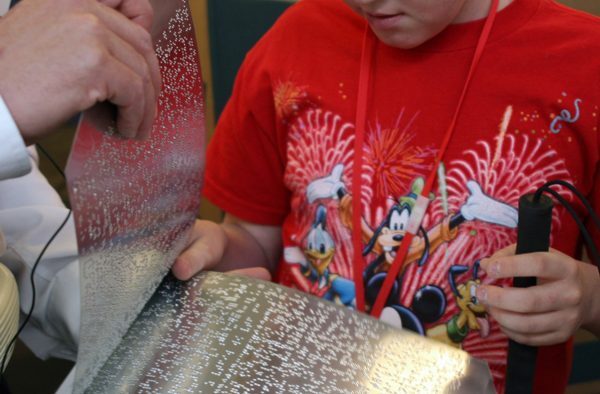 How could we possibly justify exhibiting tactile globes and braille writing machines, teaching tools meant to be used by touch, under Plexiglas covers so that the very people they were designed to serve cannot “see” them? For people who are blind or visually impaired, many museums remain extremely sterile places, despite years of plans and programs to make museums more accessible. APH opened its museum in 1994 with a different perspective. Instead of justifying why one or two pieces of sturdy sculpture can be used on a touch tour, our museum has to justify why an artifact can’t be touched. If we have several Hall Braillewriters, why wouldn’t we install one in a case that can be opened? We do still have artifacts under glass, items too fragile or rare to be touched. In those situations, we rack our brains trying to ﬁgure out how to represent them with a tactile reproduction. My colleagues at other museums often ask us for help improving their accessibility and inclusion. For me, it simpliﬁes down to three steps. The ﬁrst step is both the most obvious and yet the most daunting. We believe that you start by meeting your audience. You need to get to know some people who are blind or visually impaired. Groups like the American Council of the Blind and the National Federation of the Blind have chapters in most of the larger cities. Reach out to their leadership and work with them to identify people in your area who are already excited about your museum’s mission. Bring the group in, pour them a cup of coffee, and get to know them. Ask them about their museum experiences, what they liked and what they didn’t about other museum visits from their past. Take your new advisory team on a tour of your site. Talk about the decisions you make to preserve your community’s history, and ﬁnd out what excites them about your community. In those conversations, you will start to understand the barriers to navigation and content delivery that you face, and hopefully, you start to get excited about what your museum or historic site could offer to make people like your team feel more welcome there. The second step is staff training. At APH, our training program is called Blindness 101. We help our new guides understand what blindness is, how it affects people, and proper etiquette and language. We explain about white canes, dog guides, and how people with vision loss get around. We teach them how to serve as a sighted guide and how to give useful directions. We explore how we use words to describe our surroundings—what the ﬁeld calls audio description—and how much and how little detail to include. In short, we give them tools, so that when a visitor with sight impairment walks in the door they are ready to provide an outstanding experience, just as they would for any visitor. And our training program is ongoing. Blindness is not common, nor is visual impairment a monolithic experience. We need to train and retrain to keep our interpretive staff sharp. Fortunately, the skills we learn to improve accessibility improve the experiences of all. Our ﬁnal step is to introduce accessibility features into our interpretation, using ideas from conversations with our intended audience. Some additions are relatively simple, like making sure that there is a descriptive guide to our front door from the taxi or bus drop-off posted on our website. And while we’re there, let’s post our exhibit script in a format accessible to a screen reader, a program that turns text ﬁles into the spoken word so visitors can download the material and either read it in advance or as a follow-up to their visit. Let’s look at our exhibits and see if there are protruding cases that might not be detected by a cane, or case or stanchion supports that might trap a cane. How easy it is to ﬁnd bathrooms, and are they clearly marked in braille? Are all of our labels in large print, preferably 18-20 point or larger? Could we get our gallery guide translated into braille and stow a few copies behind the desk? Now let’s think about making artifacts meaningful for those who can’t visually understand them. What about interpreting a portrait with reproduction fabric? Letting visitors get a feel for a pioneer kitchen with touchable pots, ﬁrewood, and ingredients? Authentic artifacts are fair game as well: items deaccessioned into an education collection, obtained speciﬁcally to be handled, or protected with microcrystalline wax will help us transform a sterile and empty experience into a memory, an “I was there and we did this!” kind of moment. We will never truly make meaningful progress until we kick the doors down and let people who are blind or visually impaired into the decision-making process in our museums. What would happen if folks from your advisory team served on your governing board? We try to hire summer interns with visual impairment—what would it mean for your interpretation if a member of your curatorial team was blind or visually impaired? Last year we organized a small team, about ten or so, that we call our education associates. All have a visual impairment of some sort. Every education program that our museum educator delivers now has support from our education associates, and we are training our associates to help improve accessibility in other museums in our city. Four or ﬁve associates will visit a museum, and then sit down with staff to discuss their experience and how it can be improved. Our museum staff leads Blindness 101 training for interpretive staff as a follow-up. We are still in the beginning stages of what our company president calls the “accessible cities project.” I think the next few years will be pretty interesting, as we learn more about what is possible when we open our doors and our minds to real accessibility. Mike Hudson has been the Director of the Museum of the American Printing House for the Blind since 2005. He has an M.A. in the History of Technology from the University of Delaware and has been working in the muse-um ﬁeld for more than thirty years. Mike can be reached at mhudson@aph.org. © 2001-2018 Straight Ahead Pictures, Inc. All Rights Reserved.